Built in 1497 for the Earls of Mar. 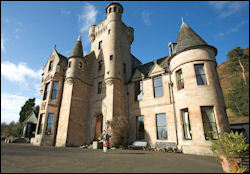 Birkhill Castle 19 - Accommodation for private parties of 8 - 24. Facilities for weddings & corporate events. Golf, shooting and fishing parties are welcome. Family home of the Earl and Countess of Dundee. Fernie 16 Lm Official site. Kilconquhar Castle 16 Lm Kilconquhar Castle Estate - accommodation, timeshares, weddings, conferences, banqueting and private functions. MacDuff's 14 KK By the cliffs at Wemyss, the castle is traditionally associated with the Thane of Fife and is said to be where Queen Mary first met Darnley (in 1565). Two towers, dating from the 16th century, are visible today. The gardens are home to the Wemyss burial ground and the ruins of a 16th century house. 4 and 5 star establishments in Fife, Perthshire and throughout Scotland. Family-run small hotel with a relaxed atmosphere. 5 miles from Stirling. Set on the slopes of the Ochil Hills with fine views. 20 minutes drive from Gleneagles. 10 ensuite bedrooms refurbished to a high standard (7 double, 1 twin/family room & 2 four-poster rooms). Restaurant, lounge & bar. Special offers and Dinner, B&B short breaks. Licensed for civil ceremonies. Facilities for conferences. Instant online booking. The Internet Guide to Scotland provides online info about Travel - Transport - Accommodation - Sightseeing - Weddings. Self drive tours with a customised itinerary to suit your interests (e.g. castles, distilleries, standing stones). Includes booking service with quality accommodation (4 star B&Bs, night in a castle or country mansion, etc.). Itinerary planning for self-drive tours (with car hire if required). Private tour guides. Clan lands research. Fully insured driver-guide with Mercedes limousine for your tailor-made guided tour. Half day, full day or extended tours. Airport collection (Edinburgh, Glasgow, Aberdeen or Inverness). Services can include itinerary planning and accommodation reservations. Meet your clan chief, trace your roots, stay in a castle, tour the distilleries. Member of HOSTGA (Highlands of Scotland Tour Guide Association).